Popular musician, Wanlov The Kubolor, early Monday morning took injury after performing at the 2014 edition of Afrobeat Music Festival, which took place at the Independence Square in Accra. The barefooted walking musician ran his foot against a broken bottle and got wounded in the process. He was attempting to join music fans who were cheering Sarkodie’s performance at the time, when the incident took place. Blood oozed out of his wounded foot for some minutes before military personnel came to offer him first aid. American musician, Lauryn Hill was the headline artiste of this year’s Afrobeat festival, with other top notch performances from Sarkodie, Efya, Chase Forever, MI, Joey B, Episode, Stonebwoy, D Black and others. 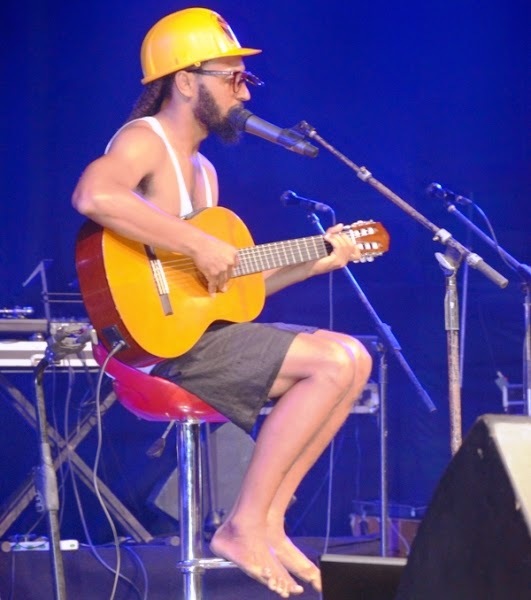 Wanlov was among the performers. He performed on Saturday and Sunday and was in his usual barefoot element with his big dreadlocks and a wrapper. But the controversial musician unfortunately left the event ground on Monday morning with an injured foot.